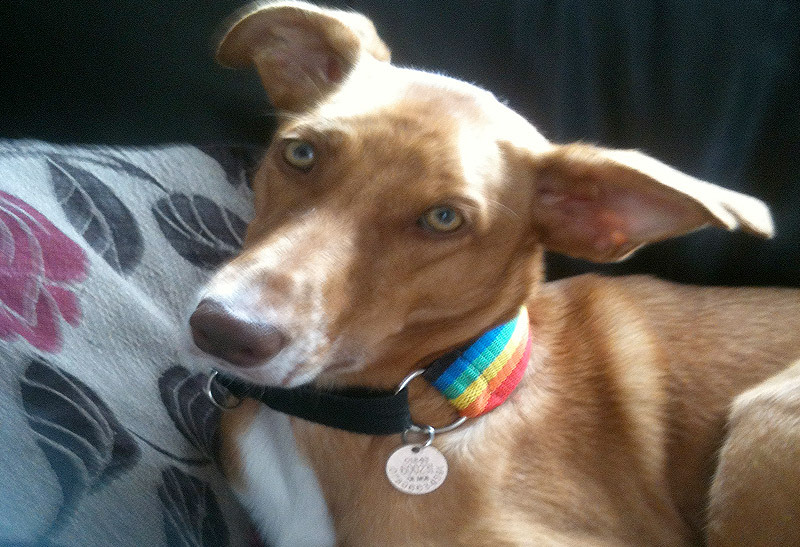 Sidney is a Podenco and now lives in his forever home with Laura Cording. “This is our gorgeous Podenco monkey, Sidney (formally Wimpy). 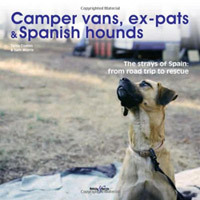 We have been told that he managed to escape from the campo and somehow found his way into town where he lived as a stray surviving on scraps of bread thrown to him by some of the kinder restaurant customers. He would regularly get stones thrown at him by the restaurant and bar owners and the local children would tease and torment him. Despite all this, we are told that he would still put his trust in people and come to them for strokes and cuddles whenever they were offered. When he was finally rescued by the AMAZING SOS Animal people, he was so weak he could barely lift his head off the ground and he had a nasty wound on his ear that needed urgent attention. He would surely have died if he had been left for any longer. 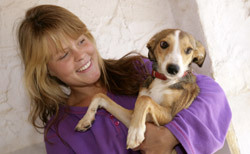 Sidney came to the UK early this year and was in a foster home for a while until we met him. Sidney is now a very much loved and adored member of our family. He is such a loving, funny, crazy boy and we all just love him to bits. He is great (if a little bossy) with our Saluki x rescue and he got used to living with our two cats brilliantly.